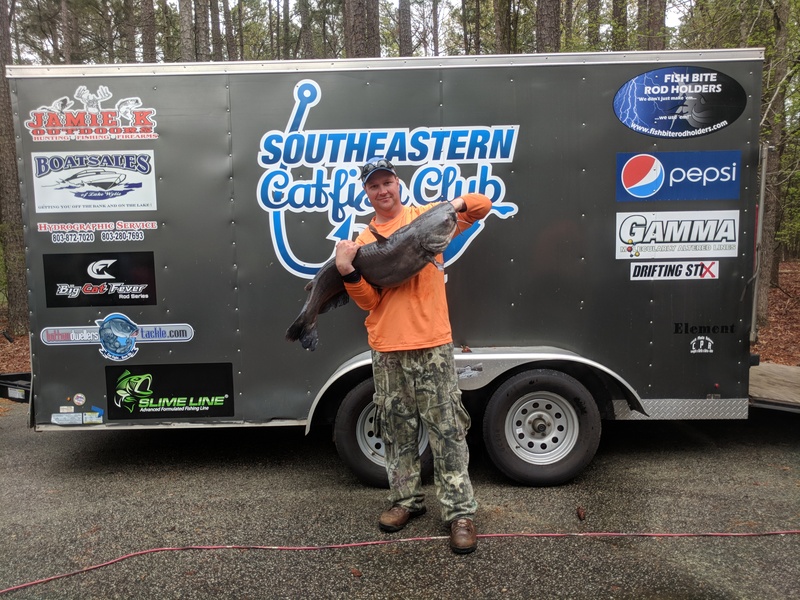 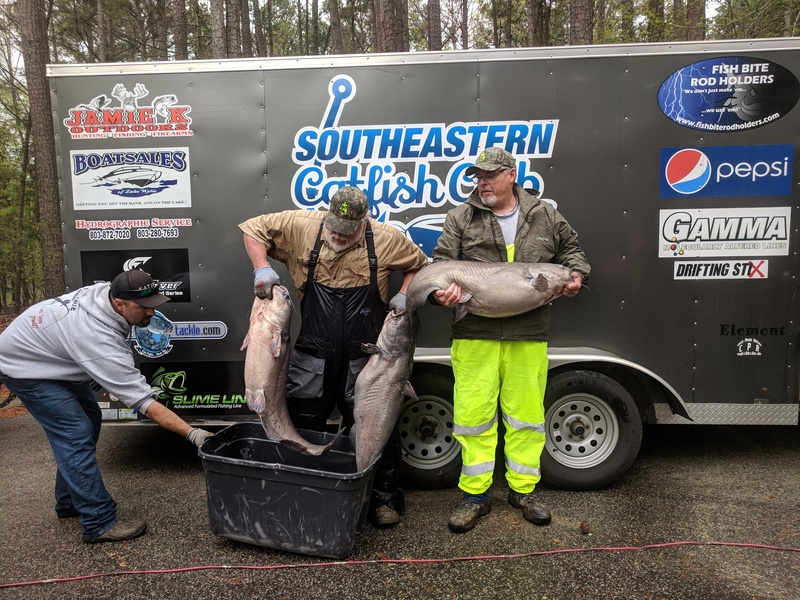 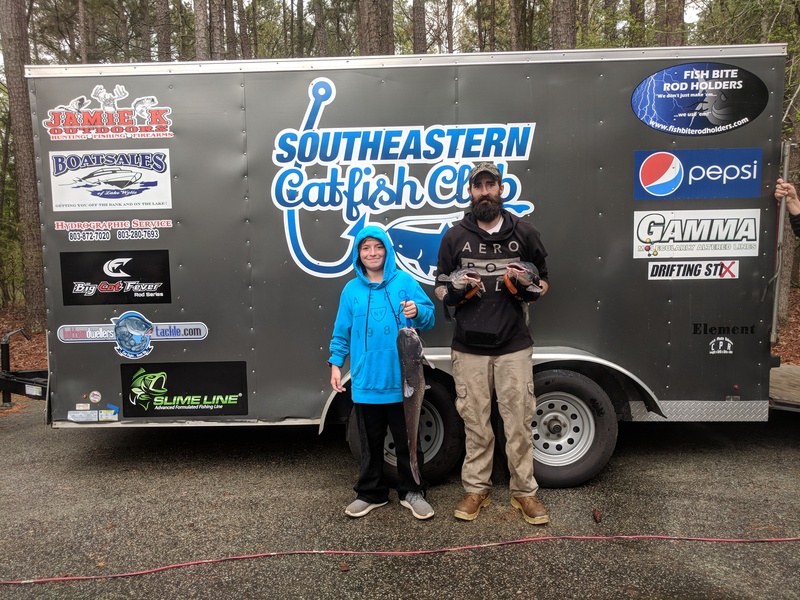 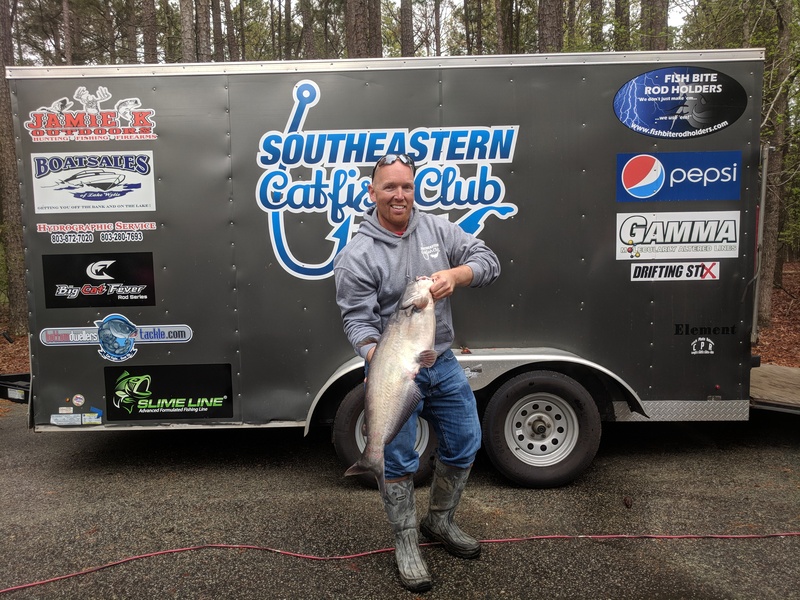 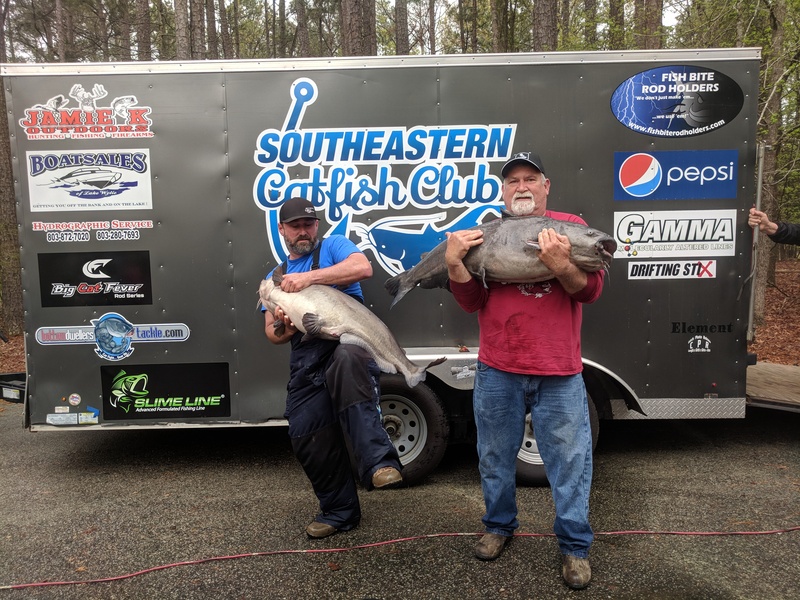 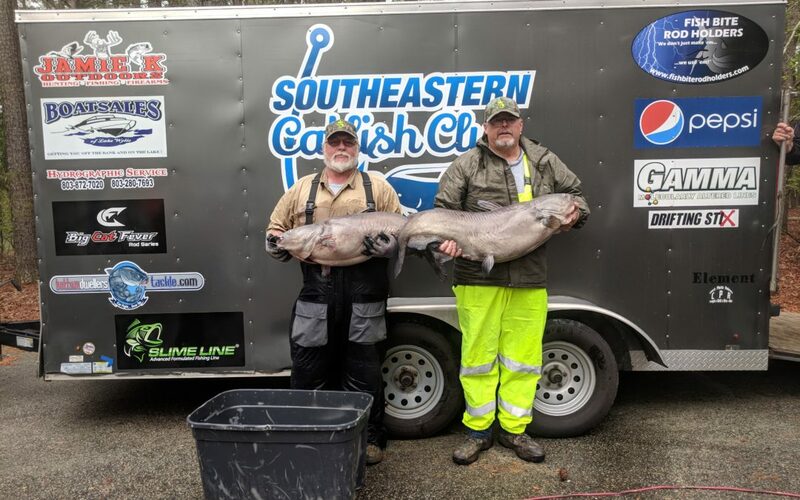 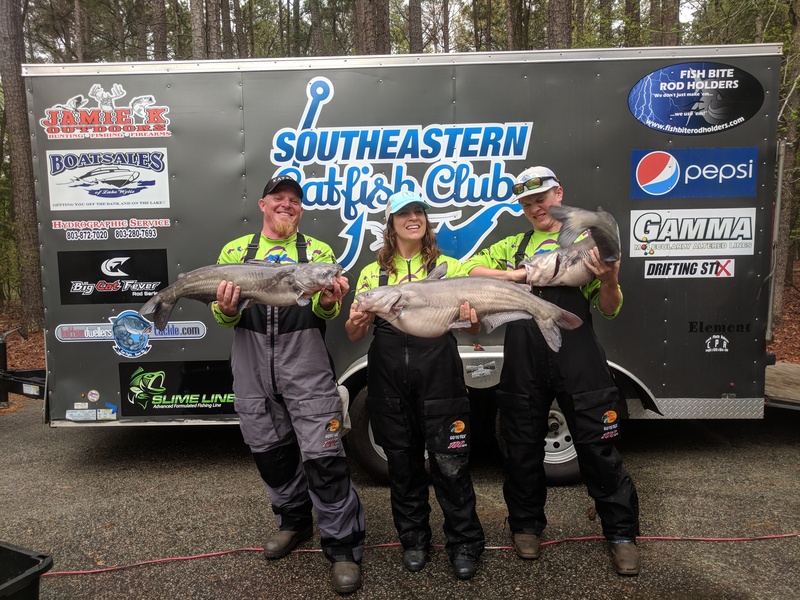 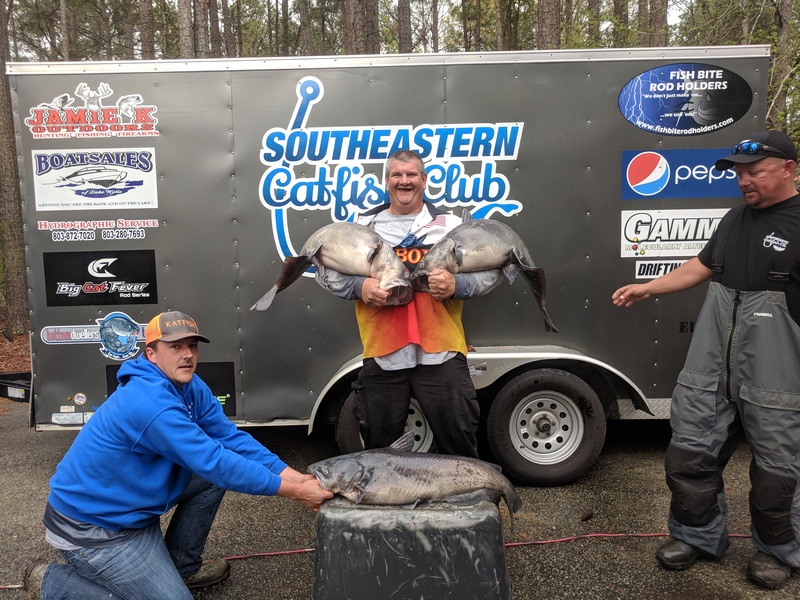 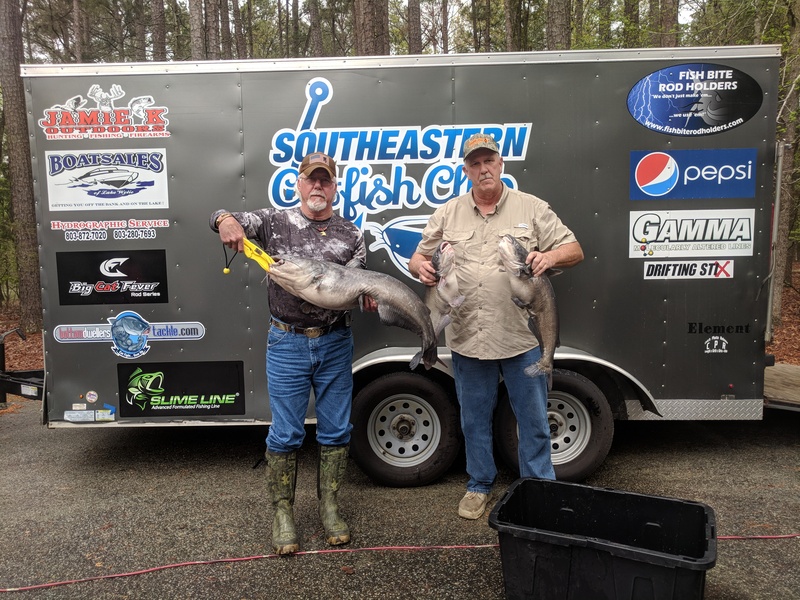 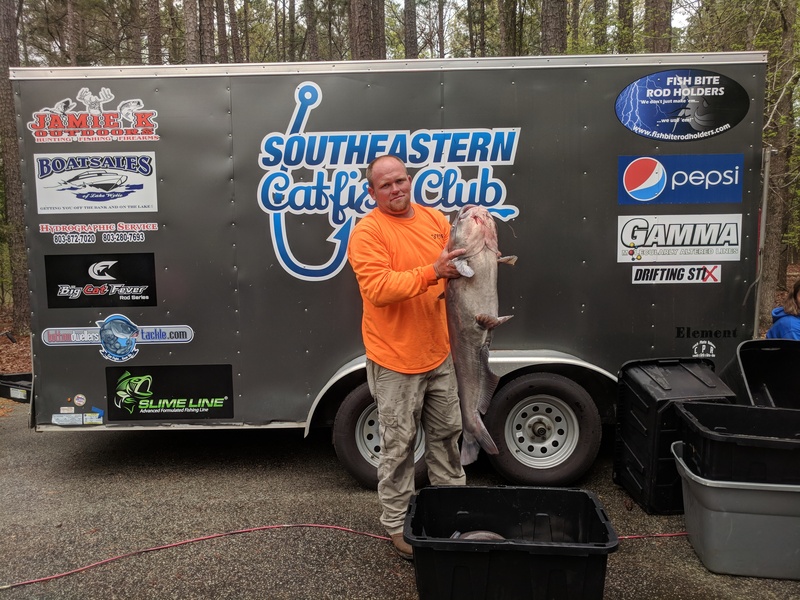 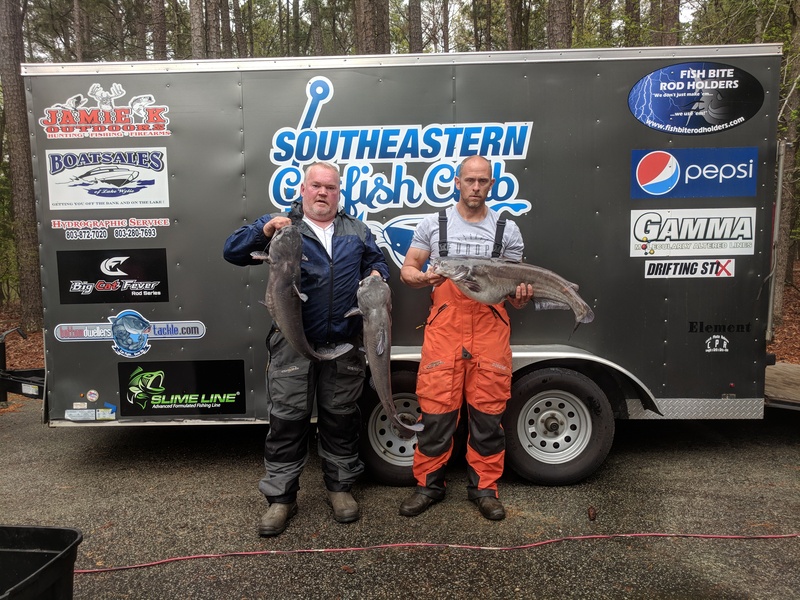 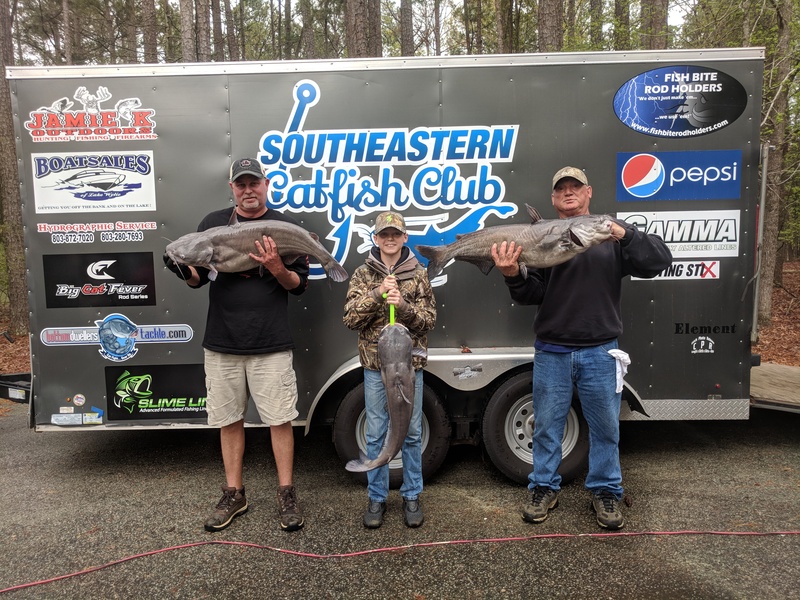 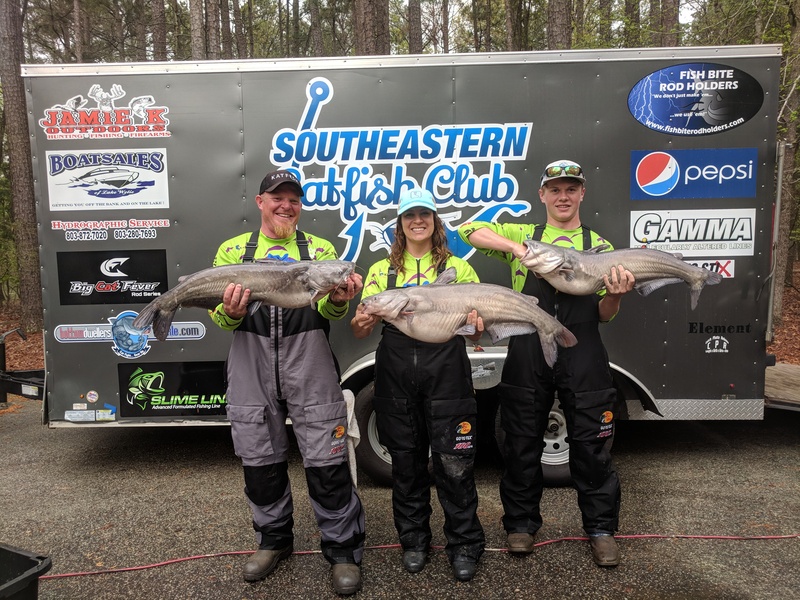 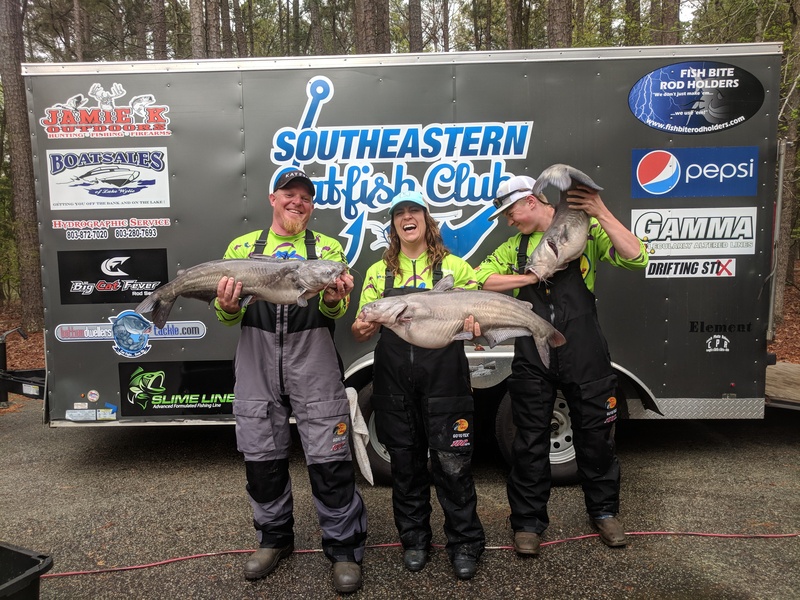 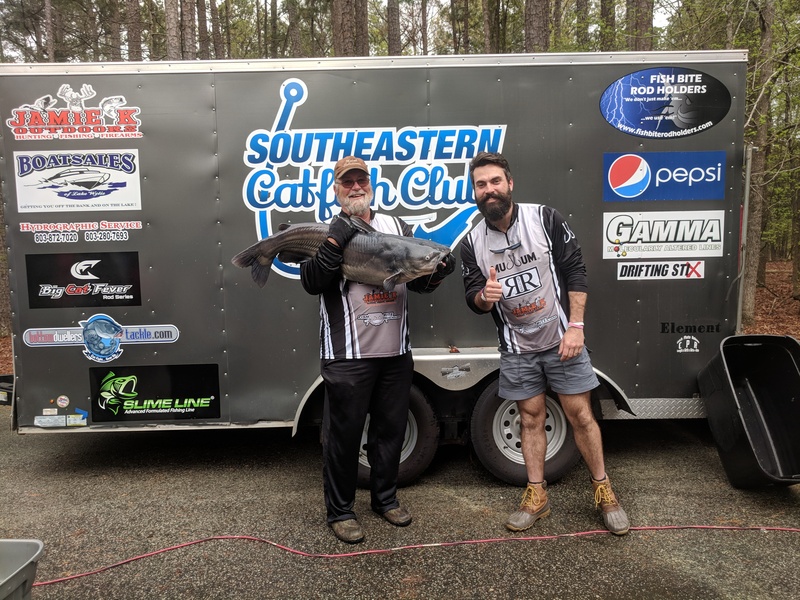 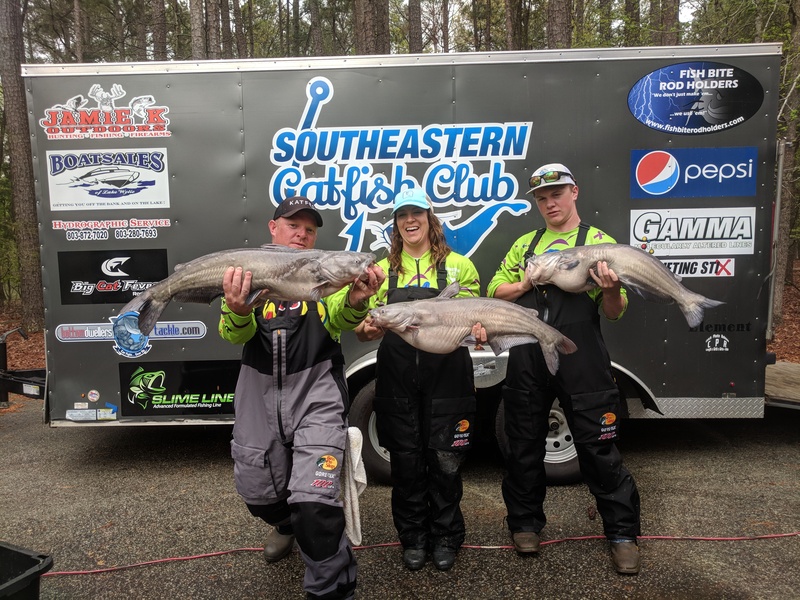 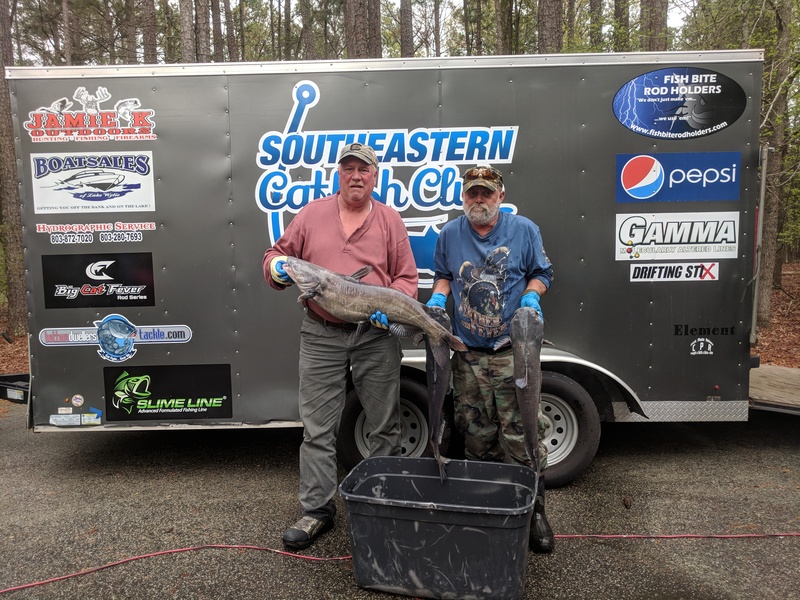 The Southeastern Catfish Club hosted its 8th tournament of the 2017-2018 season on Lake Wateree Saturday, April 7th. 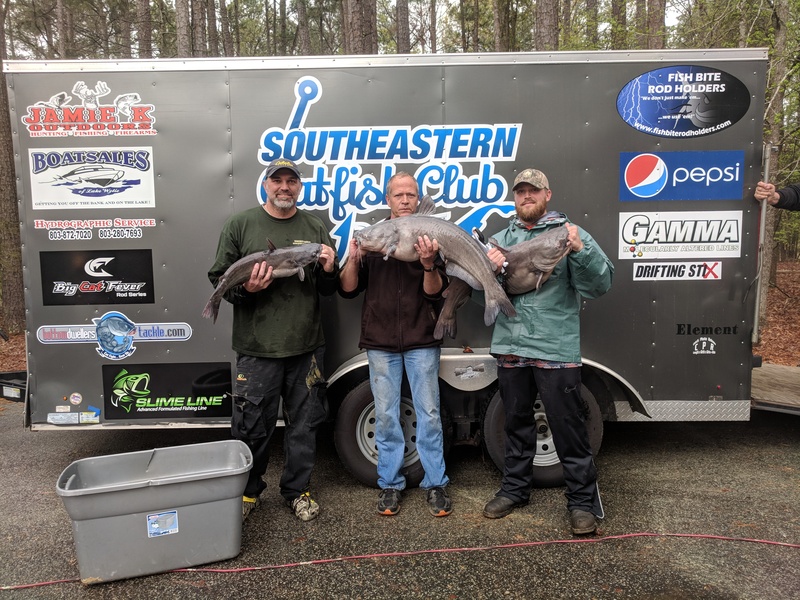 The sign-in table opened at 5am sharp, and several teams were already waiting to register. 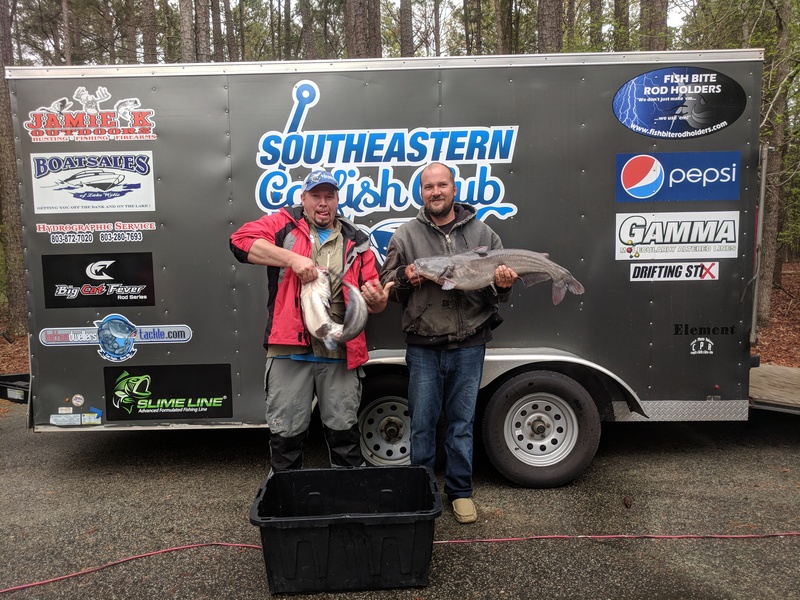 The kind folks at the Lake Wateree State Park opened the store at 5:30 am giving anglers a chance to buy last minute convenient items and hot coffee. 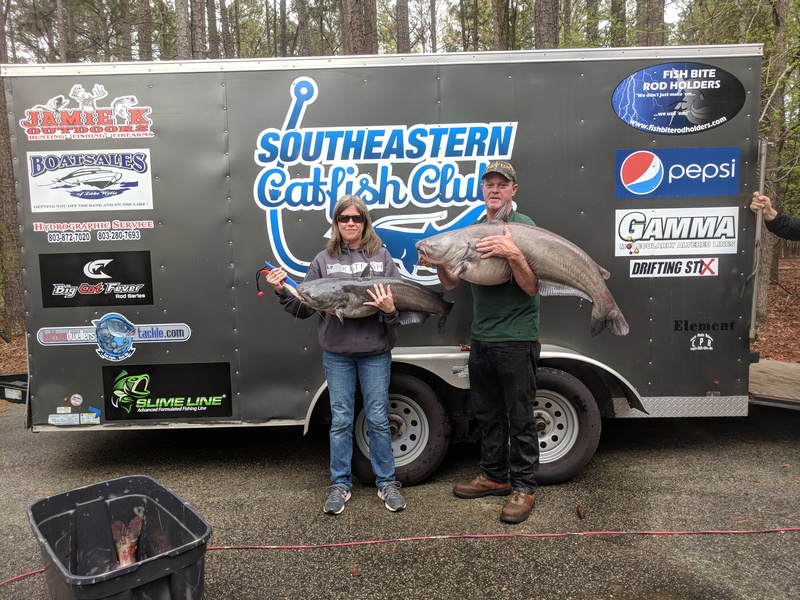 Thank you again Wendy! 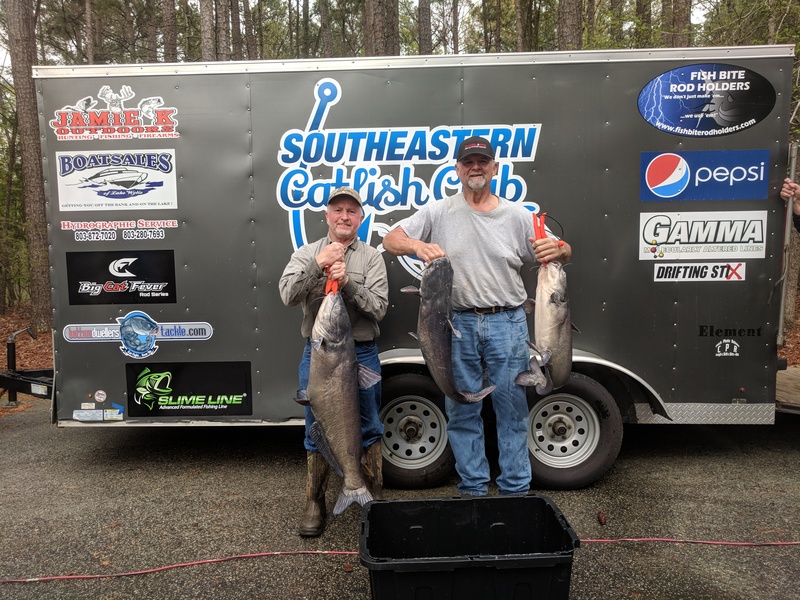 The line to the boat ramp grew long stretching past the park entry pay station, but we were able to close the registration at 6:45 am on the nose. 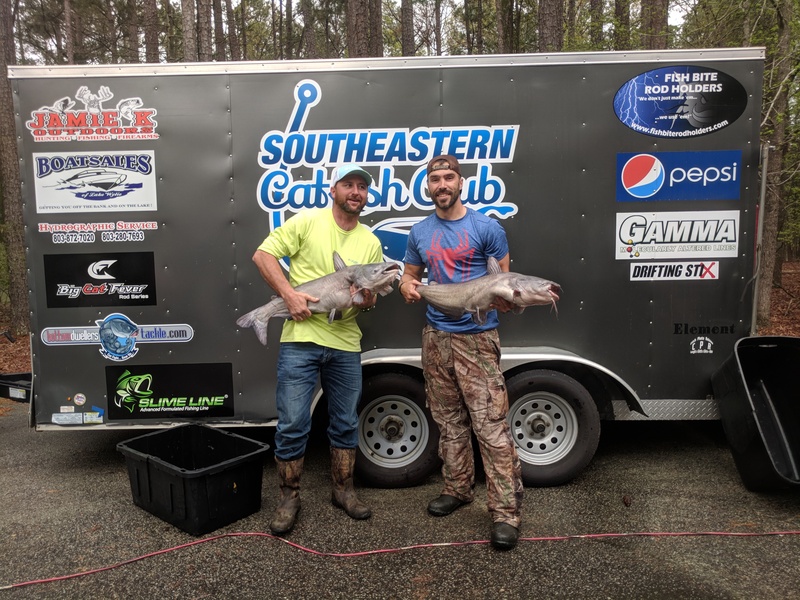 Kaleb Page from Big Cat Fever joined us for the first time and fished with Jamie and Blake Williams of Team Backland Outdoors. 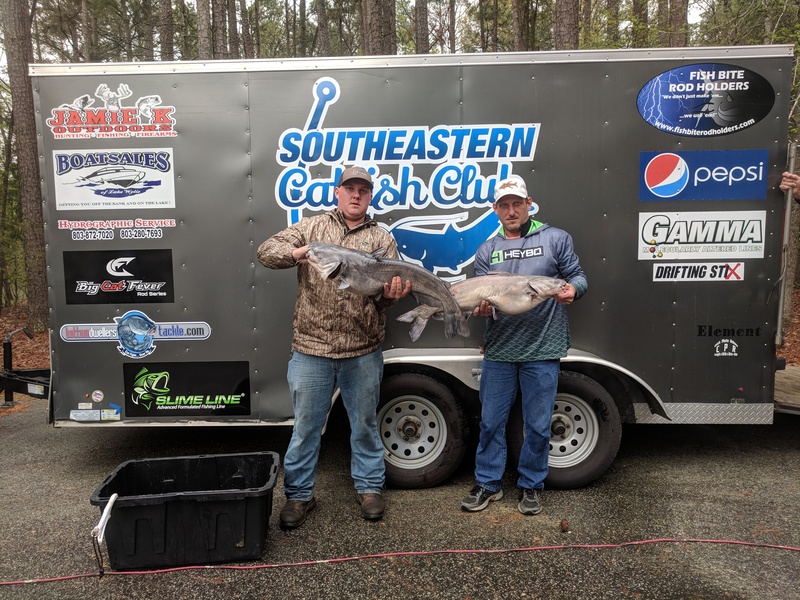 At blast-off, 46 teams and 113 anglers were ready to cash in on the Spring bite and compete for the $4,600 purse! 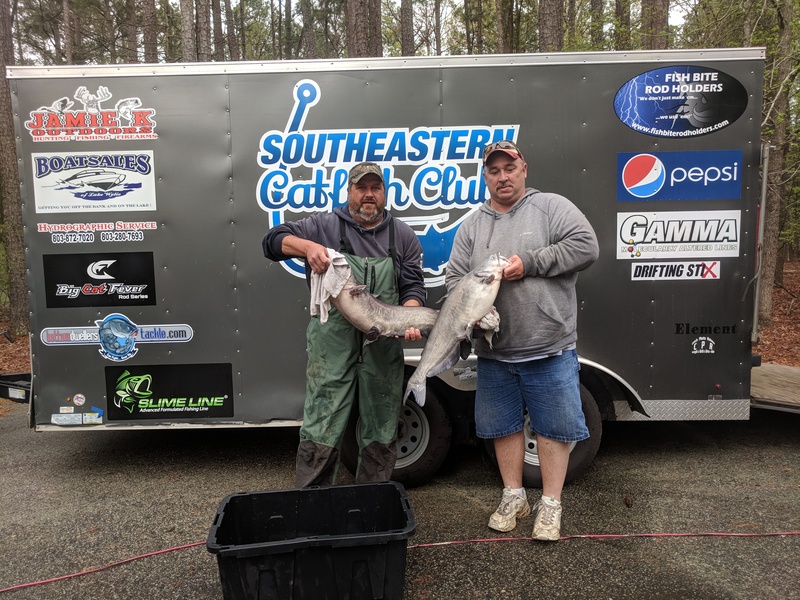 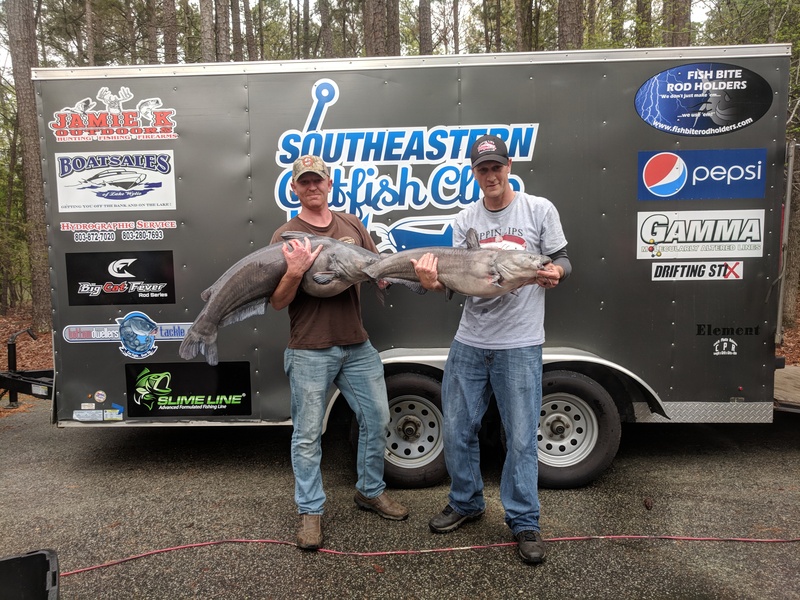 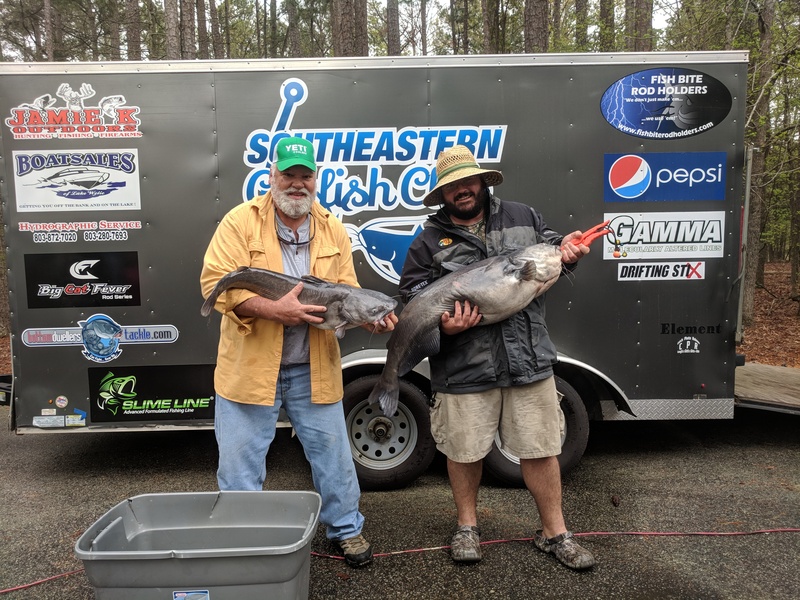 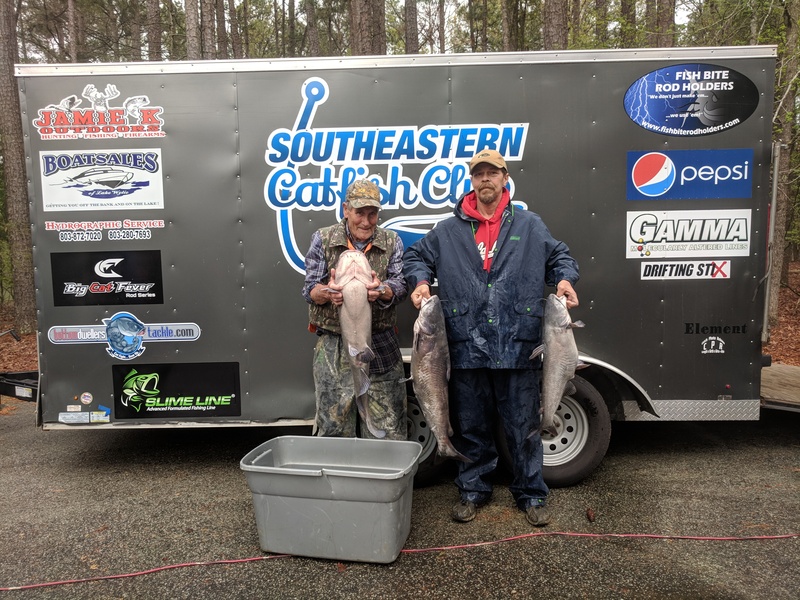 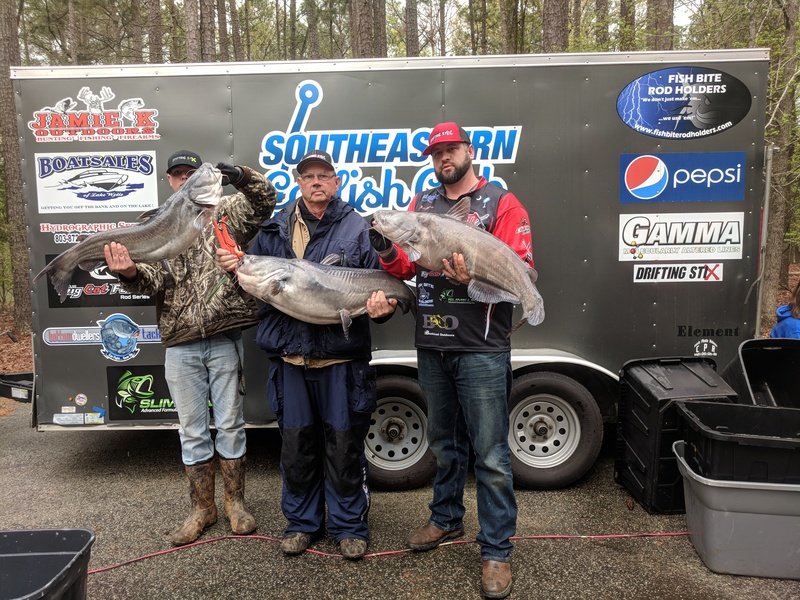 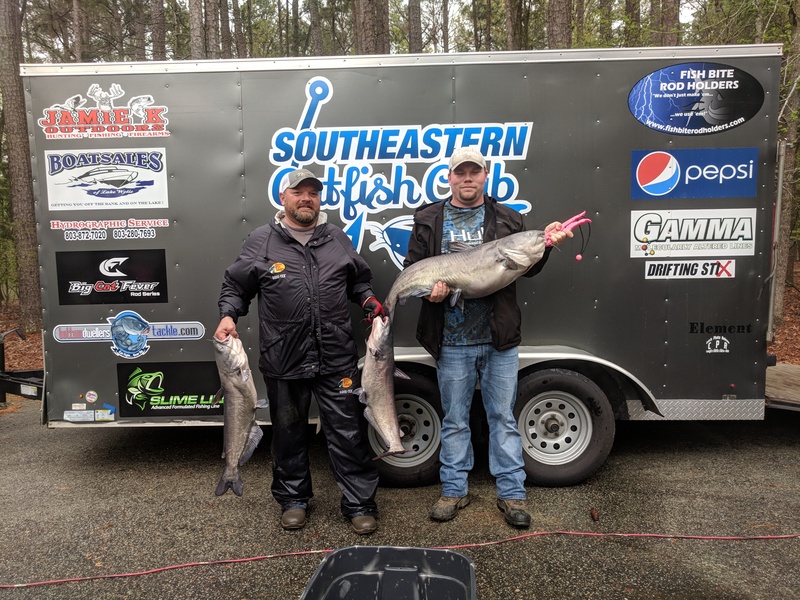 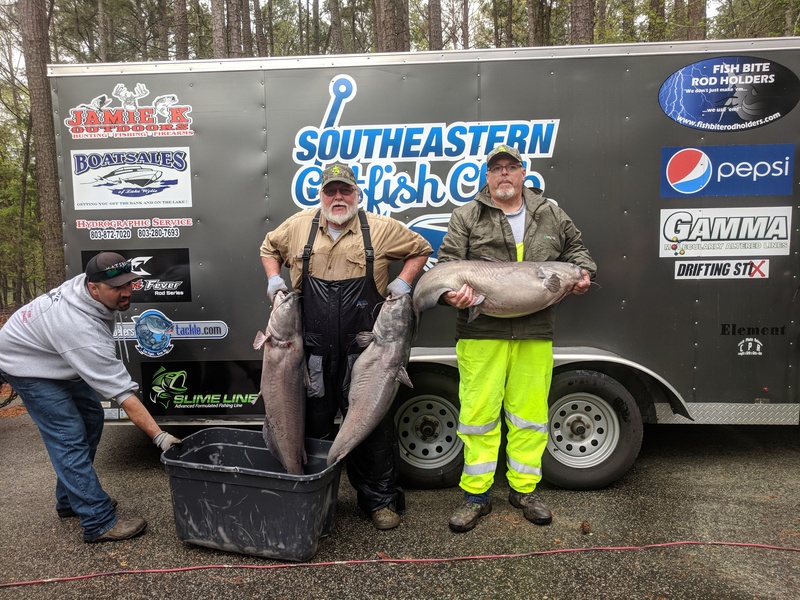 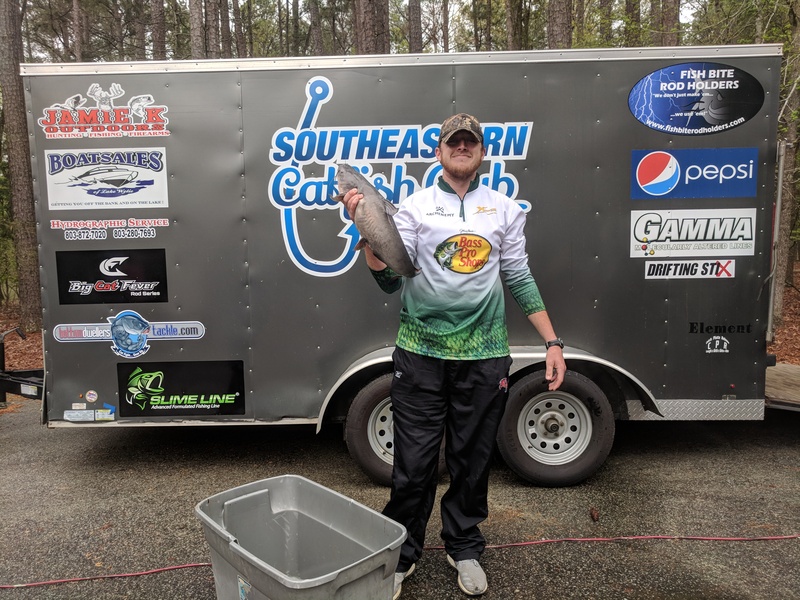 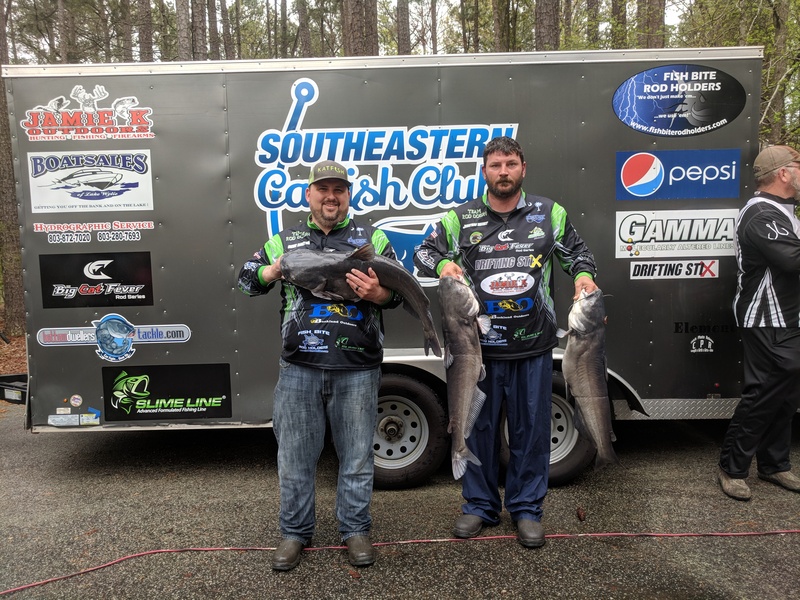 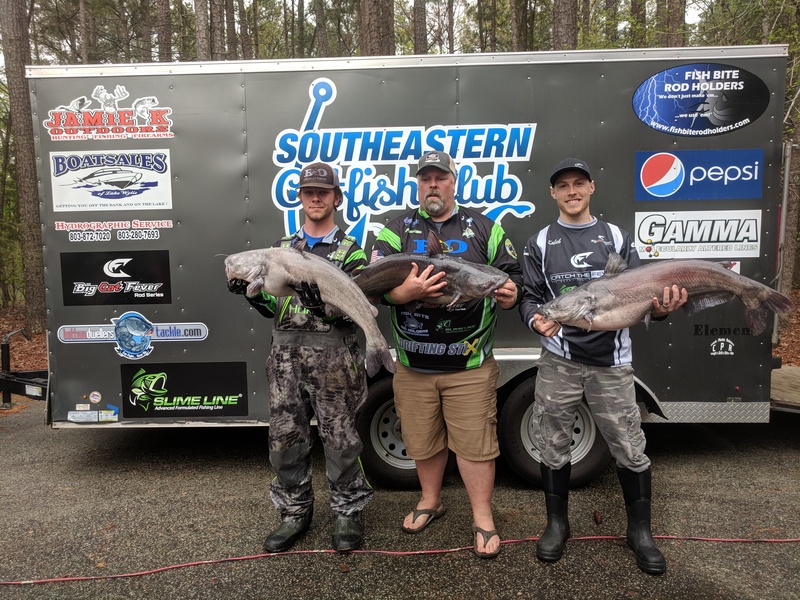 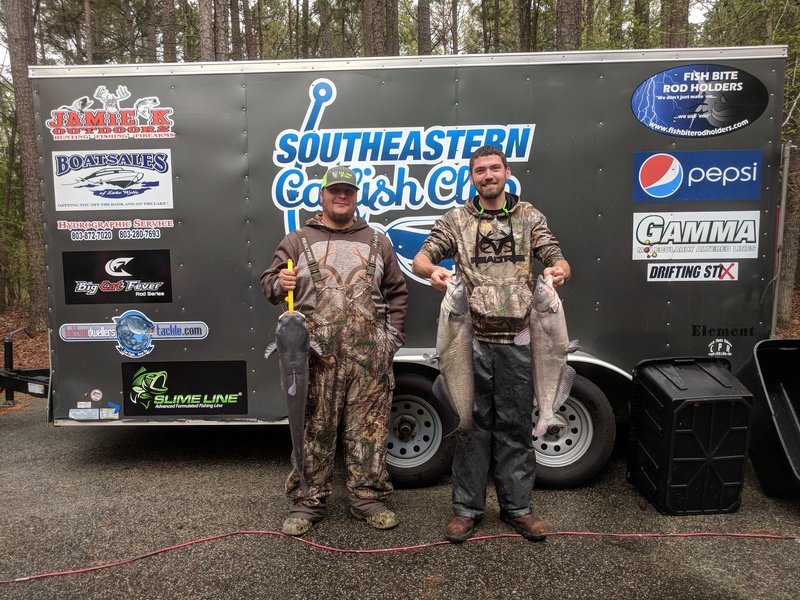 Our April tournaments at Lake Wateree usually produce a great bite, and this year didn’t disappoint. 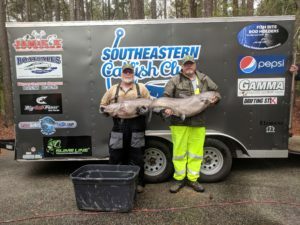 Weather guessers called for heavy rain and strong winds during the week leading up to Saturday, but luckily, they were wrong. 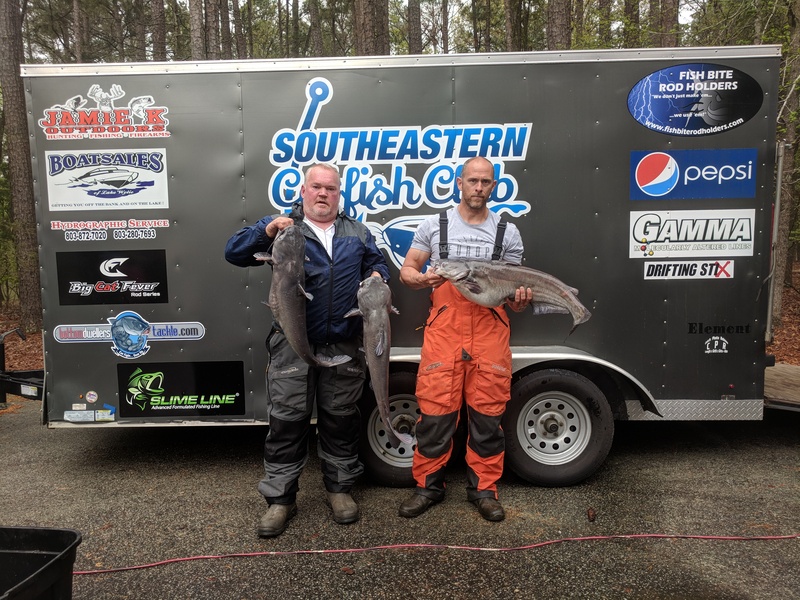 The winds were calm nearly all day only giving way to an occasional slight breeze. 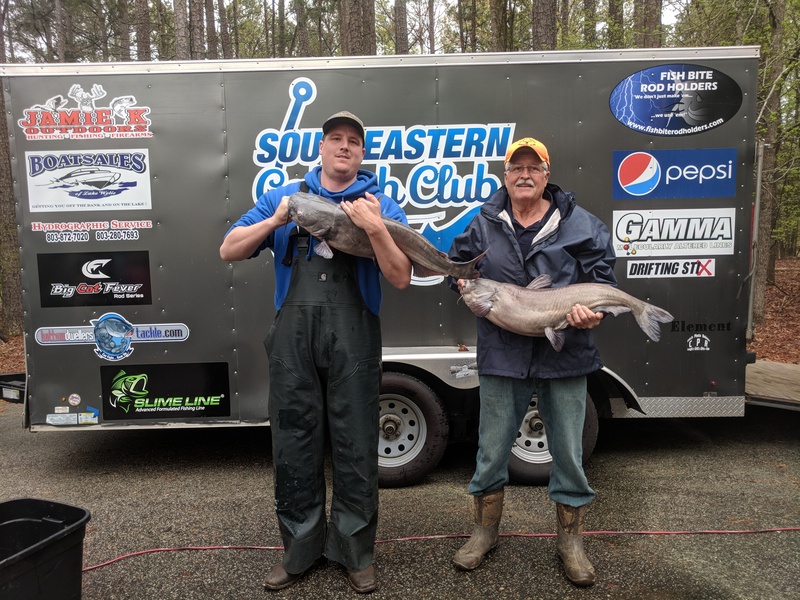 Anglers reported rain on both ends of the lake but nothing more than a heavy sprinkle. 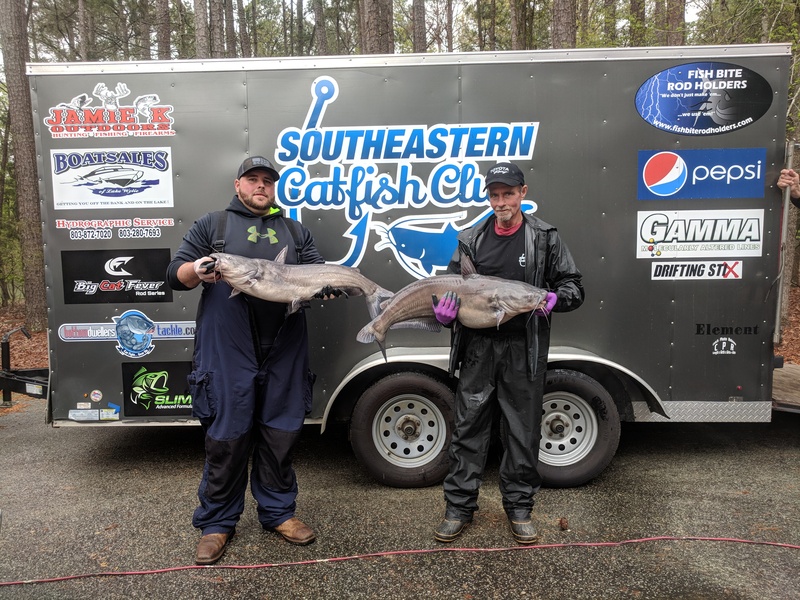 In the end, David Faulkenberry and Reece Holley of Team In God We Trust broke the tournament season total weight record with a massive 122.14lb stringer! 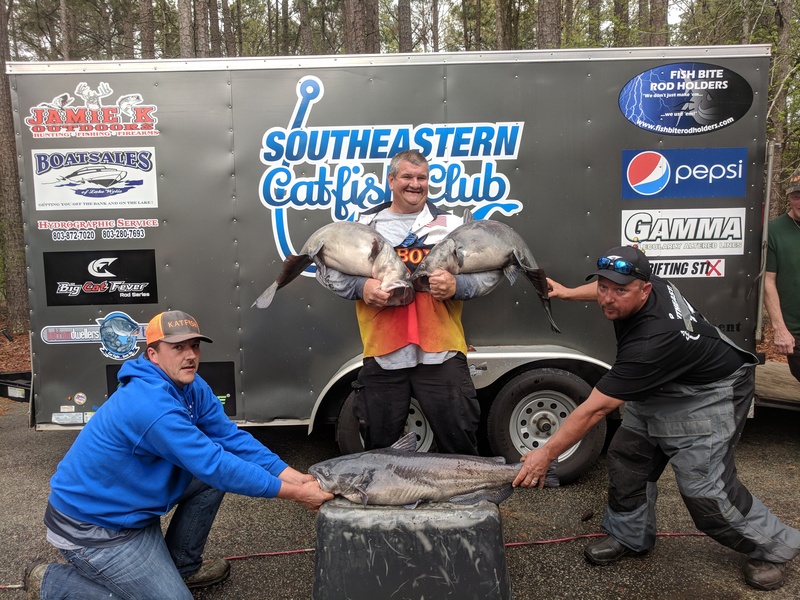 Needless to say, it was plenty of weight to take home 1st place and collect a whopping $2,270! 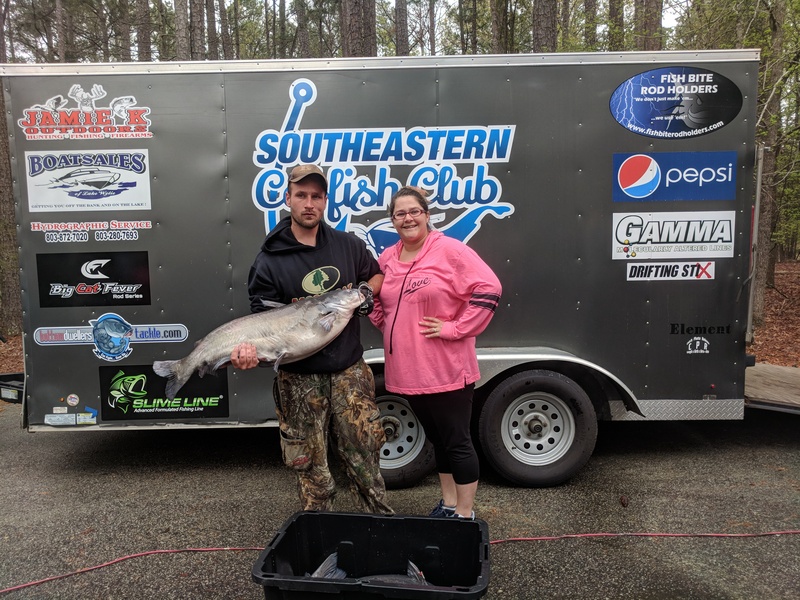 Ashley Campbell of Team Rip Lipp finished in 2nd place with another massive stringer of 105.52lbs and collected $1,130. 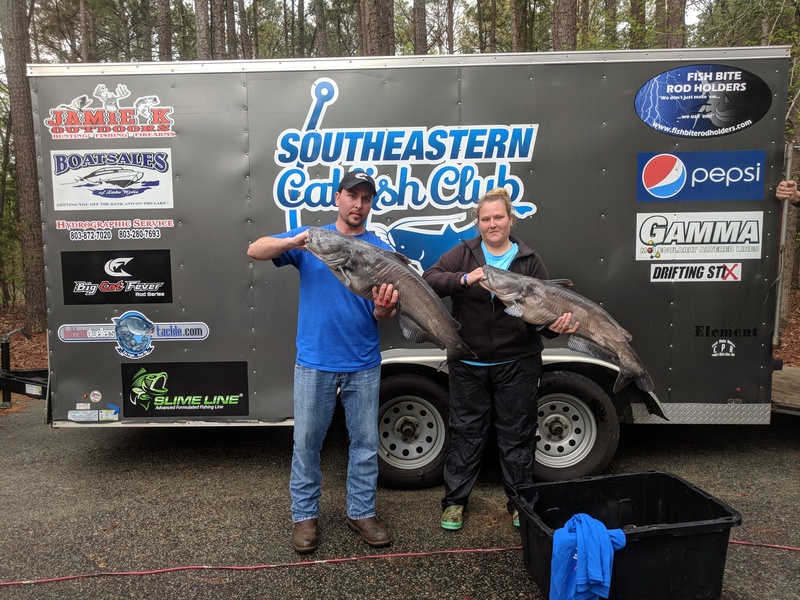 Sam and Amy Williams of Team Whisker Gitters finished in 3rd place with a 99.67lb stringer and collected $380. They also had Big Fish of the tournament with a bruiser blue weighing 55.90lbs and collected another $580 bringing their total to $960. 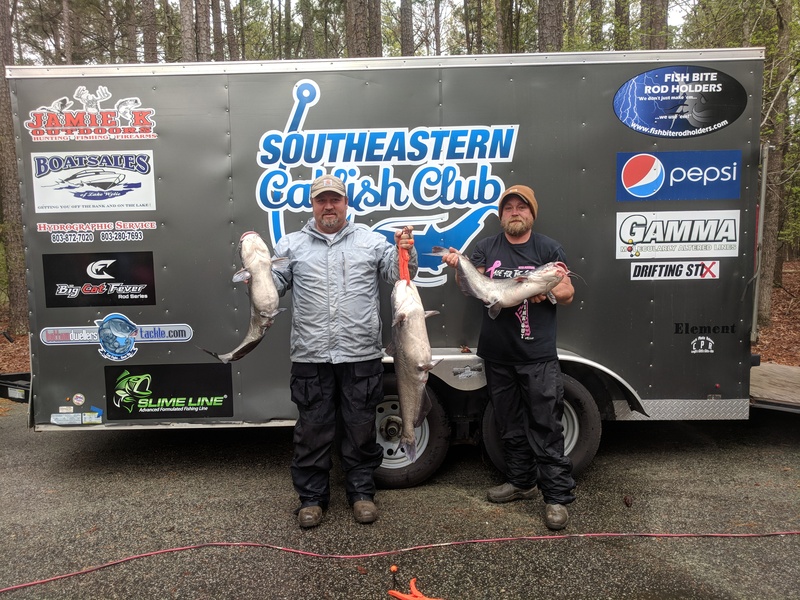 Rocky Childress and Andy Griffin of Team Cat Whisperer had 2nd Big Fish and collected $245. 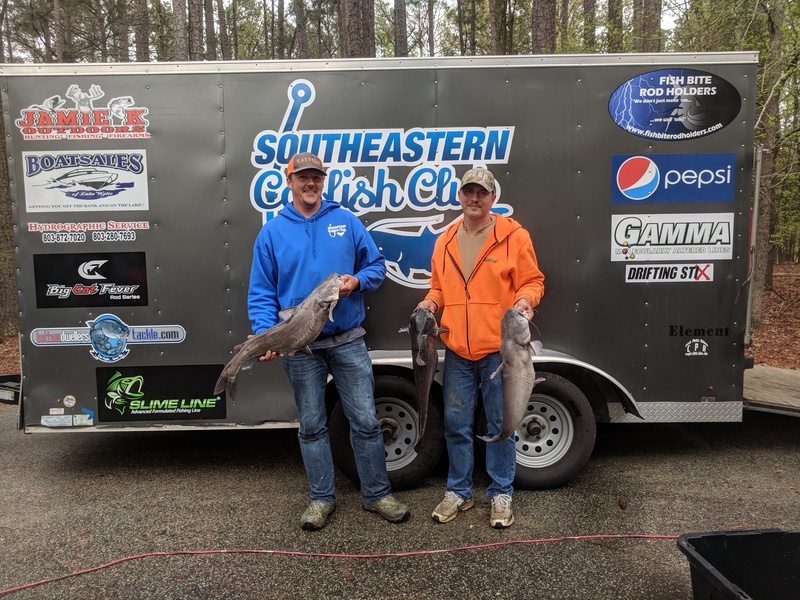 Congratulations to David Faulkenberry and Reece Holley of Team In God We Trust their first win on the SCC trail and putting their names in the record books! 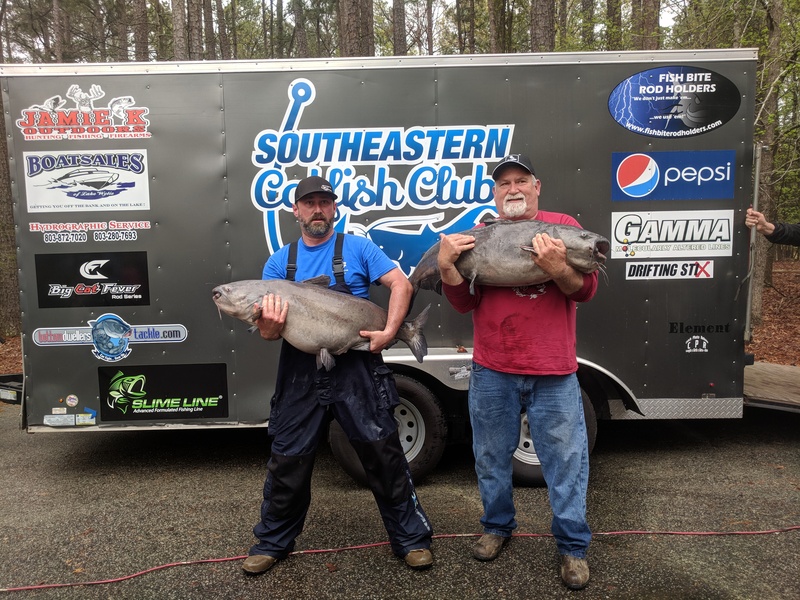 We look forward to seeing everyone next month back on Lake Wylie on May 5th!